CALCUTTA — A Martha Street resident expressed concerns to trustees with a neighboring St. Clair Township property — one that has since been reported and is being investigated as a nuisance. The complaint was received Aug. 20 and during the Aug. 21 meeting, it was reported the Martha Street property was in foreclosure and information was presented to the Columbiana County Health Department. Township officials reported the roof appeared to have caved in at the time. Barnes said he started to look into the home during the past year with Trustee Robert Swickard, who was absent from Tuesday’s meeting. Barnes called the property a safety issue due to several children residing in the area, along with rodents and mosquitos that have appeared as a result. He also brought up the idea of zoning issues. Barnes also said he believes some homeowners have not been taking care of their properties of late, noting one in which a couch is sitting outside. Noting there have been several properties with vehicles and junk, Barnes said he wanted to offer his help in anyway possible, perhaps even putting zoning on the ballot. Trustee Chairman James Hall acknowledged the nuisance property issues have been a problem throughout the township. “We’ve been working diligently trying to get these abandoned homes cleaned up, and it’s been such a long drawn-out process, that you kind of get disgusted and you beat your head against the wall,” Hall said. The trustee mentioned that for zoning to happen, a resident first would need to start a petition for such a move, and it would be followed by the formation of a committee and meetings. Trustee James Sabatini also expressed frustrations with nuisance properties, saying it’s taken nearly two years before an issue can be resolved. “The problem without any zoning … when people start to find out about that kind of thing, that gives them reason to gravitate to a place where nobody’s telling them what to do, or we don’t have the authority to keep them from doing certain things, or you as a neighbor don’t have any rights left,” Sabatini said. A similar manner was done in Liverpool Township, and Sabatini suggested trying to do the same with one precinct to see the results. Meanwhile, in another issue, Cartwright Avenue resident Allen Cain expressed concern with the conditions of the roadway. 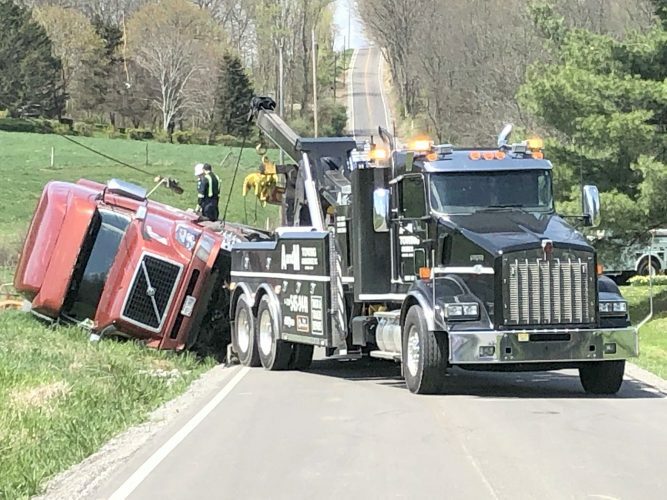 Last winter, Cain said, a portion of the chip-and-seal on the roadway broke down near the edge of his driveway, which he said might have been as a result of road crews backing in as they cleared the roads following the ice and snow. The road, he said, was last patched about three years ago, adding his belief is it needs repatched. “With the rain we’ve had, it’s making a rut down past the driveway,” Cain said. At the intersection of Cartwright and Curry avenues, Cain said the roadway had been filled in due to a water leak, adding he believe it was not done properly. He said during heavy rains, slag, mud and dirt had hit the roads,. He mentioned trenching so water does not hit the street again in that manner. 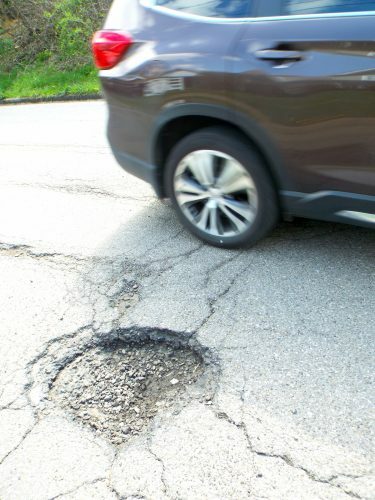 Cain also mentioned a pothole on Cartwright that needs filled, and a fireplug that had been used was covered up and left alone. In relation to the road not filled properly and the fireplug, road supervisor Scott Barrett advised Cain it was a city issue, not a township issue. Barrett said city officials would need to have a look. Officials, meanwhile, will have a look at the other matters.